Outgoing showrunner Russell T Davies has given an interview to BBC Radio Four's Front Row. He talked about Doctor Who, Torchwood and The Sarah Jane Adventures. The programme can be heard on the BBC iPlayer for the next six days. The new edition of the Radio Times has been published in the UK, and features a foldout cover for Torchwood: Children of Earth. The magazine includes a four-page article on the five-part story, including a "script-to-screen" section. There is also an interview with John Barrowman, in which he criticises the BBC for cutting the series to five episodes following its move to BBC1. Barrowman said: "We were the most successful show on BBC3, ever. We moved to BBC2 because the ratings were so good, the ratings were great again and we were beating shows that had been on BBC2 for a long time. The decision was made to go to BBC1, and then we were cut. From 13 episodes down to five. "The five episodes, the miniseries as I call it, are incredible, I have no doubt about that, but personally, I felt like we were being punished. Other shows move from BBC3 and 2 to 1, and they don't get cut. So why are we? It felt like every time we moved we had to prove ourselves." A BBC spokesman has denied Torchwood was being "punished", saying they wanted to create an "event" to launch the show on BBC1, with the new series stripped across one week. "They are faced with their fiercest threat to date – one which throws the future of Torchwood and the entire human race spiralling into danger. Do they stand a chance of saving mankind?" Even if you've never seen Torchwood in your life, the brief description from its official website should at least make it clear that Last of the Summer Wine this is not. "But it will be a new experience for die-hard fans, too: as well as moving to primetime BBC1 from BBC2, it's also switched from the usual 13-part weekly format to five parts to be run on consecutive nights. "It's a trick that's been used to good effect before – last year's Criminal Justice and the recent Occupation, for example – and it's something we can expect more of. As increasing numbers of us watch what we like, when we like, 'event TV' will be needed to ensure we keep having compelling reasons to tune in on particular nights. Not that Torchwood star John Barrowman is entirely happy. Find out why – and what it takes to produce a a drama like this – on page 14." Torchwood comes to BBC Radio Four this week with a specially commissioned series of three plays occupying the long running Afternoon Play slot. Starring John Barrowman, Eve Myles and Gareth David-Lloyd the 45 minute plays will be transmitted at 2.15pm on Wednesday, Thursday and Friday. Once transmitted they can be downloaded from the BBC iPlayer for a period of 1 week. When PC Andy arrests a teenager for shoplifting, he thinks it is going to be a routine case. Then he sees the weapon she is carrying and decides to call in the Torchwood team. The Torchwood team are led to Delhi on the trail of a dangerous energy field. When a Cardiff hospital is inundated with patients who have fallen into coma – like trances, Torchwood move in to investigate. In a new documentary, Mark Gatiss explores the history of the incredibly popular Target book range. 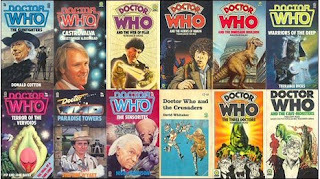 In the days before domestic video players and multi channel Television, the only way for fans to relive Doctor Who episodes, or catch up with stories they had missed, was through the hugely popular Doctor Who novelisations, published throughout the 70's and 80's. Gatiss, a self-confessed Doctor Who fan, who has written and stared in the revived series, presents On the Outside it Looked Like an Old Fashioned Police Box. The documentary features some of the best excerpts from the books and interviews with publishers, house writers, illustrators and the actors whose adventures the books depicted. The programme is on Radio Four on Tuesday 23rd June at 1130 BST. Radio Four can be heard across the UK and around the world via the BBC iPlayer. Once broadcast the programme will be availabe to listen again for seven days. The BBC Press Office has released details for week 27, and confirms that Torchwood: Children of Earth will be broadcast during that week, 4th-10th July. The show is currently listed as "unplaced", meaning that the exact time and days have yet to be finalised. Captain Jack Harkness, Gwen Cooper and Ianto Jones (John Barrowman, Eve Myles and Gareth David-Lloyd) return for a new adventure in Torchwood – Children Of Earth, a five-part series for BBC One. An ordinary day becomes one of terror, as every single child in the world stops. A message is sent to all the governments of Earth: "We are coming." But, as a trap closes around Captain Jack, the sins of the past are returning and long-forgotten events from 1965 threaten to reveal an awful truth. John Barrowman plays Captain Jack Harkness; Eve Myles plays Gwen Cooper; and Gareth David-Lloyd plays Ianto Jones. Torchwood also stars Kai Owen as Rhys Williams; Peter Capaldi (Doctor Who, Skins) as John Frobisher; Paul Copley (Coronation Street, The Bill) as Clem; Liz May Brice (Bad Girls, The Bill) as Johnson, Lucy Cohu (Forgiven) as Alice Carter; Nicholas Farrell (Casualty 1909) as Brian Green; Susan Brown (Brideshead Revisited) as Bridget Spears; and Cush Jumbo (Harley Street) as Lois Habiba. Various news sources online and in print - including science-fiction website io9 and British tabloid newspaper the Sun - have in recent days been running a picture from behind-the-scenes of David Tennant's forthcoming two-part finale in Doctor Who. The image, apparently a screen grab from a video, shows Tennant along with guest star Timothy Dalton and another actor, whose presence in the story may be considered a spoiler, so his name is given in the spoiler box below. Dalton's role in the forthcoming specials is not currently known. The other actor pictured along with Dalton and Tennant is John Simm, who played the Master in the final three episodes of the third series of Doctor Who. Just announced: Special guests at this year's San Diego Comic-Con include new series creator Russell T. Davies and the show's lead actor, David Tennant. They will join former executive producer Julie Gardner and director Euros Lyn on a special panel on Sunday, 26 July, 10:00 am - 11:00 am. Doctor Who spinoff Torchwood is also returning to Comic-Con, with star John Barrowman appearing on a panel also featuring Davies, Gardner and Lyn. Sharing space at that panel will be the new BBC America series, Being Human. Creator and writer Toby Whithouse plus lead actors Russell Tovey, Lenora Crichlow and Aidan Turner, talk about the inspiration for the show and what it's like to play three twenty-somethings with secret double-lives – as a werewolf, a vampire and a ghost. Fans can visit the BBC America booth (#3629) to capture their own photograph alongside part of the Doctor Who set as well as purchase exclusive merchandise including David Tennant figures. Also featured will be exclusive previews of the upcoming Doctor Who specials and the final episode of Torchwood: Children of Earth. Read more at the IGN website and the Action Figure Insider website. The BBC Press Office has released the official press pack for the forthcoming five-part serial Children of Earth, which forms the third series of the popular Doctor Who spin-off. The release includes information on cast and crew, as well as interviews with chief writer and executive producer Russell T Davies and cast members John Barrowman, Eve Myles, Gareth David-Lloyd and Kai Owen. Experience Design, the team behind the Doctor Who Up Close exhibition in Cardiff Bay, have announced plans to open a Torchwood-themed exhibition in the Bay area. The ambitious plan aims to reconstruct sets from the Torchwood Hub seen in the series, based across two levels, including an upstairs recreation of the Cardiff Bay watertower with lift to the "hub" below! It is also hoped that costumes from the series will also be on show. Head designer of Experience Design, Martin Wilkie, said: "A Torchwood Exhibition would be a great addition to the Bay area. We have looked at several sites for a Torchwood Exhibition but we are hoping that this one might be available soon. The appeal of Torchwood brings many visitors to Cardiff Bay, especially to see the Torchwood Water Tower. The building we are hoping to use for the Torchwood Exhibition is near this famous TV landmark." A Georgian building in Bute Crescent has been identified as a possible location for the exhibition, and Cardiff council are currently reviewing the application, which is hoped to open in July. In the news: BBC South Wales, South Wales Echo. The British Fantasy Society, which has presented the British Fantasy Awards since 1971, is this year adding a category for Best Television, and Doctor Who has been nominated for the new category, which does not appear to be strictly limited to the fantasy genre. Also nominated are "Battlestar Galactica", "Dead Set", "Supernatural" and "Dexter". Doctor Who: The Writer's Tale by Russell T Davies and Benjamin Cook has also been nominated for an award in the Best Non-Fiction category. A full list of the award nominees is linked from the BFA's website. The winners will be announced in September at the BFA's convention, FantasyCon. Thanks to "Rolnikov" of the Doctor Who Forum. After a period on hiatus, Who Party, Canada's Doctor Who convention is returning on Saturday June 13th, 2009 in Toronto. A semi-annual event first started in 1978, Who Party is one of the longest-running Doctor Who events in the world. Who Party is taking place at the Best Western Primrose hotel at 111 Carlton Street and runs between the hours of 10am and 8pm. Who Party is a fan run, not-for-profit event. For more information on Who Party Toronto visit their website. The Doctor Who Blog is reporting that Canada's Space channel is now the home of Doctor Who in Canada, officially ending the series' time with former co-production partner the Canadian Broadcasting Corporation. Space will air Planet of the Dead on Saturday July 25th. Waters of Mars and the two other specials to follow will air on Space in late 2009 and early 2010. Beginning in March 2010 Space will have the rights to show Series One to Four of the show as well as The Christmas Invasion and The Runaway Bride. Voyage of the Damned, which was never aired by the CBC, will be available to Space as of April 2010. The Next Doctor was already aired by Space in March 2009. Finally, Space will be airing Series Five in 2010. Launched in April 2005 with a great deal of publicity by the CBC just 10 days after the premiere on the BBC Doctor Who eventually found itself out of favour with changing CBC management despite continued strong ratings through all four series.